Matt and Erin’s wedding reception was held at Bakers of Milford. What was cool is that there was hot air balloons taking off from right next door. 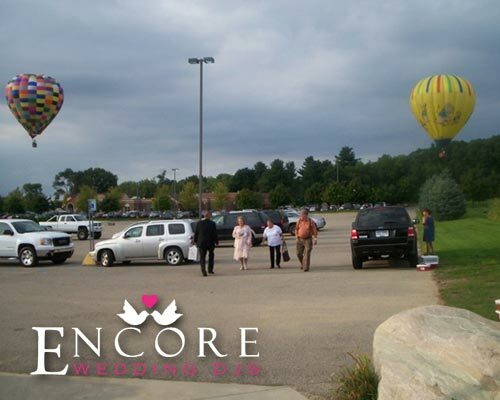 There was 5 hot air balloons taking off only 20-50 ft above the parking lot! Since they went with purple and an offset orange for the colors our Advanced Aerial Light Show worked great (we have a purple and orange preset). Usually the girls are the ones that go crazy for the bouquet, but it got intense when the garter was thrown, I feared for my life as guys scrambled for it. At one point of the reception one of Matt’s friends told me that he won a talent contest in high school for MCing a Kriss Kross song and that I had to play Jump Jump, that part was the highlight of the night! We wrapped up the reception with Tom Petty’s Mary Jane’s Last Dance. You can view their satisfaction survey at the link. Once again congratulations Matt & Erin!!! For everyone else that is looking for wedding DJs in Milford Michigan, remember to check our availability.